I can't make up my mind if that little guy is going to fall asleep or puke. Why does he have a bucket. This looks like the outtakes of one of those cute kids in costumes shoots that are so popular. The shots you aren't supposed to see. I bet he's pooped his pants too. These guys just look tired. I don't know what they are, but I kind of like a lazy toy. I have a Pokemon plush who's special power is sleeping. That him there on the right, the Snorlax. 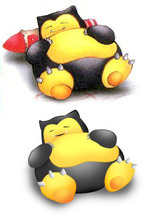 I never liked Pokemon, either the game or the cartoon, but I did like the Snorlax. I have a little cat guy named Meowth that's from the same series. He's cute. He used to share space on the top of the couch with lots of other stuffed toys but that couch got thrown out. The toys are in boxes somewhere.